In October of 1986, as a delegation of Jews active in community affairs toured a closed Auschwitz-Birkenau, investigative journalist Ann Weiss fell behind the others. It’s as clear to me now as it was when I was 12: A grainy shot of a huge bulldozer crawling forward with the occasional lurch, its huge scooped blade pushing a dark load toward a trench. The camera angle changes. The machine is not shoveling snow or earth, but a tangled hill of limp bodies, pushing them as a mass. Yet as heap reaches the brink and tumbles over, they separate, each falling alone into the darkness below. I don’t think my visual introduction to the Holocaust was much different from that of other schoolkids of my vintage. Sure, we learned the facts, memorized the dates and took the tests, but what stayed with us was the sheer, staggering size of the thing. All those people — thousands and millions of them. The problem is that numbers that big can become abstract. When you’re staring at a literal hill of dead humans, it’s hard to distinguish features. That by no means diminishes the tragedy, but you process that sort of thing one way. And you process what Ann Weiss has done another way. Ann Weiss will speak at the opening of her exhibit at the Holocaust Museum in Naples What the Pennsylvania author, photojournalist, teacher and mother has to show us is anything but abstract. Her traveling exhibit, “The Last Album: Eyes from the Ashes of Auschwitz-Birkenau,” opens with a gallery talk Sunday at the Holocaust Museum in Naples. It’s a collection of perfectly ordinary photos: toddlers playing on the beach, newlyweds raising a toast, class pictures, family dinners. What makes these images extraordinary is that they contain the faces of the dead while they were still robustly alive. Eyes from the Ashes article by Andrea Jacobs wins top Journalism award! The Intermountain Jewish News won six Simon Rockower Awards for Excellence in Jewish Journalism at the American Jewish Press Association’s annual conference June 27-30 in Dallas, Texas. Among these awards was Andrea Jacobs, first place in feature writing, “Eyes From the Ashes” (Feb. 19, 2010), on Ann Weiss’ accidental discovery of pre-Holocaust family photographs in a locked room at Auschwitz. CLICK TO READ the winning feature article of the year, “Eyes From the Ashes” by Andrea Jacobs. The Holocaust Memorial Center in Farmington Hills, Michigan helps visitors remember. Its appearance and placement in the community, with architecture echoing a concentration camp, fully visible from a busy street, flanked by a bank and a Chinese restaurant, challenges passerbys to consider the horrors of the Holocaust in the everyday. It houses a permanent exhibit exploring Jewish history and culture prior to World War II. Area Holocaust survivors speak to tour groups. And the special exhibit The Last Album: Eyes from the Ashes at Auschwitz-Birkenau gives visitors other images to consider, images that didn’t matter to the Nazis, images that tell us what, and who, the people victimized wanted to remember. To curate, in its most old-fashioned sense, means more than gathering a collection. The word implies a sense of care. In 1986, Ann Weiss separated from her guided tour group at Auschwitz I. She wanted silence, and took some time before seeking to rejoin the group. When she began looking for them, she got lost. She could hear voices, but could not see them, when she encountered an employee. The employee invited her to see something not on the tour: a collection of about 2400 photographs. The pictures were not of abuses. They were not from the Nazi perspective, officially or unofficially. They were the spared mementos of prisoners, specifically from the people in the final liquidation and deportation of the Bedzin ghetto, August 1-3, 1943. From that moment forward, Weiss began to care for the photographs. She sought to copy them and bring them to the light; she sought people who might remember those in the pictures. She gathered stories and made connections. Her work is collected in a book, and in this traveling display. By curating this collection, Weiss gives the viewer a chance to acknowledge a fuller reality surrounding the Holocaust. The exhibition includes sweethearts and couples, portraits of children, friends walking together, people visiting resorts. Some of the people have been named, including eight pictures grouped together with the title The Huppert Family. In this portion of the exhibit, we learn that Artur, Grete, and their son Peterle sent notes and pictures to Artur’s parents. We see an artful picture, “The Triple Exposure of Artur Huppert,” a picture of Artur and Grete at their wedding celebration, two pictures of Artur and Grete with their son, Peterle, when he was 16 months old. Between the pictures of the family sit three portraits of Peterle at 16 months, with a beautiful head of curls. The eighth picture in the Huppert family collection features a delighted Artur kneeling behind Peterle. 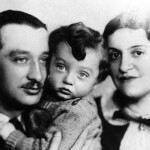 Together they hold picture frame containing two portraits: Josef and Rosa Huppert, Artur’s parents. The direct impact of the Holocaust on Artur, Grete and Peterle is told in the captions near the photos. It is recorded that Artur and Grete do not survive their transport to a slave-labor camp. Peterle was on the same transport as his mother, and his fate went unrecorded. If only. If only Peterle had lived to be 120, a phrase evoking Moses and his good lifespan. If only the world had not known such cruelty and violence. If only the Huppert family album continued. The viewer is left to ponder not just the culture lost, and the lives lost, but the future lost. And yet. The display calls us beyond loss, to remember something else too, to not let evil and death have, in the exhibit’s words, “the final punctuation.” It asks us to end the sentence with life. Ann Weiss became lost while touring Auschwitz, one of history’s most horrific places, and it was a misstep that put her on a remarkable path of discovery. She became connected to a generation and to a culture that was almost entirely destroyed by hatred and intolerance. She is the founder and director of the Eyes from the Ashes Foundation, an educational organization. Ann Weiss talks about her rare and moving collection of pre-World War Two photographs that belonged to deportes to Auschwitz-Birkenau on WHYY 91FM (Philadelphia) with Marty Moss-Coane. The photographs are featured in her book The Last Album. She came across a hidden cache during a visit to the camp in the early 1980’s. Joining in are TOLA GILBERT and BEN HIRSCH who found images of friends and loved ones among Weiss’ collection. View a story on The Last Album and Ann which appeared on the Chronicle News Magazine on WCVB-TV, Boston. Article appearing in the THE EMORY WHEEL on September 21st, 2010. Click on the image to view the full article. Article appearing in the THE DENVER HERALD DISPATCH on February 25, 2010. Click on the image to view the full article. Article appearing in the THE VILLAGER on February 25, 2010. Click on the image to view the full article. Asked to speak from her perspective on the Holocaust, Ann emphasized the echoes of having said “Never Again” til her throat is raw. She continued, “This is the time, this is the place, we must be the generation who fights for justice until no innocent victim is left to stand alone, against the oppression, brutality and cruelty of a totalitarian government. As the Jews in World War II were abandoned by the world, we much not abandon these innocent people suffering so greatly by the actions of the Chinese governemtn. And let this be the time when we never say “Never Again” again! This global torch event is being held in cities world-wide until the Beijing Olumpics. Ann at Cohen Hillel Academy, Swampscott, MA. In addition to Ann’s keynote presentation, the evening featured a tribute to Survivor Abraham Rogozinski, and special honoring of L. P. Summers, of Atlanta, Georgia. May They Read to Be 120! Helping the Jewish Publication Society turn the page on 120 years in business are some of its locally based authors. 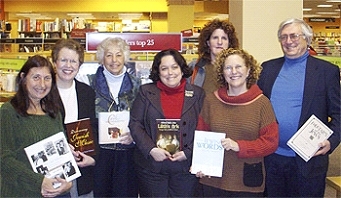 Gathered at the Borders bookstores in Wynnewood (from left) are Ann Weiss (“The Last Album: Eyes From the Ashes of Auschwitz-Birkenau”), Marsha Bryan Edelman (“Discovering Jewish Music”), Pecki Sherman Witonsky (“The Cave of Reconciliation: An Abrahamic/Ibrahimic Tale”), Deborah Bodin Cohen (“Lilith’s Ark: Teenage Tales of Biblical Women,” a 2006 National Jewish Book Award Winner), Joyce Eisenberg and Ellen Scolnic (“The Dictionary of Jewish Words: A JPS Guide”) and Dan Ben-Amos (“Folktales of the Jews,” winner of a 2006 National Jewish Book Award.) Not pictured is Shelley Kapnek Rosenberg for her books “Raising a Mensch” and “Adoption and the Jewish Family: Contemporary Perspectives.” Luckily for all, George Costanza had his own artbook to keep him busy. Ann Weiss speaks to World Congress of Russian Speakers at HIAS April 25, 2007. The following article appeared in the Russian edition of The Forward in May 2007. It was an unusual session of the Permanent Seminar on Jewish Genealogy under HIAS auspices. This time the presenter was Ann Weiss, a child of the Holocaust survivors. In 1986, while she was participating in a special tour in Auschwitz, Ann found boxes with the pictures, which belonged to the Nazi’s victims. Trying to erase not only the lives but even the memory of the people the wanted to destroy, the executioners usually burned the personal holdings of their victims, that is the items they could not utilize. Twenty four hundred pictures were occasionally saved. 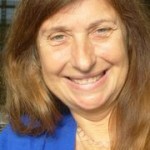 Since this moment Ann Weiss changed the direction of her life. She decided to identify the people on these pictures and find those who survived. It was a task of a Herculean scale and this petit woman with a soft quiet voice a little bit louder than a whisper overcame thousands of obstacles to fulfill her goal. During the seminar she told the attendees, a group pf Russian Jews how she managed to identify 400 people. Ann showed the book The Last Album: The Eyes from the Ashes and a video. She later said that never before she had such a responsive and empathic audience. Naturally, the Russian Jews know something about suffering. 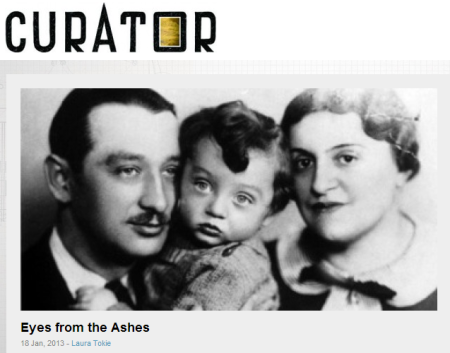 2nd Front-Bookmarks section entitled “The Photos They Carried” by Sandee Brawarsky, Jewish Week Book Critic. Arts and Society section entitled “Auschwitz Album: Snapshots of Lives Lived Well” by Carl Schoettler, Sun Staff Writer. Friday Books section entitled “Snapshots That Were Not Supposed To Be Seen” by Sam Orbaum. “Searching For Humanity Amid the Holocaust” by Geoffrey Gettinger, Contributing Writer. Main Line Life, Montgomery County Newspapers of April 11-17th, 2001 entitled “To the Millions Whose Stories We Will Never Know” by Katie McDonald, Main Line Life Staff. Photo of Artur, Grete and Peterle Huppert appeared in The Times Literary Supplement. Weiss has catalogued, and successfully identified, many of the photos.